In the time since Brock Turner sexually assaulted a woman behind a dumpster in 2015, Stanford University has taken pains to recast the scene of the literal crime: Gone is the infamous dumpster, now replaced with some nice paving stones, two benches and a fountain. Emily Doe, as the victim is known, was originally meant to supply a quotation for a memorial plaque, completing its transformation. 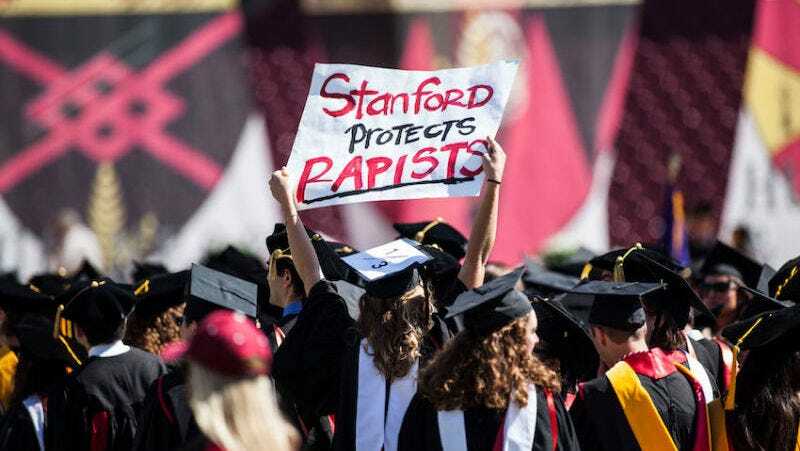 Instead, Doe will no longer be involved with the plaque at all, since Stanford reportedly rejected two of her suggested quotations, both pulled from her famously heart-rending victim’s statement, campus outlet The Fountain Hopper first reported. According to the site, Stanford decided that instead of using Doe’s quotations as originally planned, it would rather just pick a line itself. And of the many, many standout sentences to choose from, what did it go with? “I’m okay, everything’s okay,” a snippet of text surely not meant to characterize Doe’s feelings about her assault, but uttered in attempt to calm her terrified sister upon her release from the hospital. “Given the situation, Emily felt the best course was to decline to participate in the memorial plaque,” Dauber said. Meanwhile, the judge who handed Turner his appallingly lenient sentence will now face a recall at the hands of California voters. May justice be served.